It's Monday, Picture Books Past. 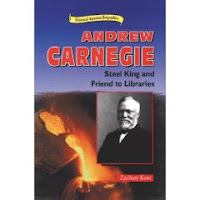 To quote the ALA site, "Andrew Carnegie (1835-1919) may be best-remembered by his establishment of free public libraries meant to make available to everyone a means of self-education. In 1881, when he began the project, very few public libraries existed; he spent over $56 million to build 2,509 libraries throughout the English-speaking world." What a guy! Read more about him here and more about the Carnegie libraries here. He certainly was the most influential force bringing books to Americans one hundred years ago. And so many of those same charming and distinguished community library buildings are still in use today, with shelves full of picture books. Is there one near where you live? Try looking here. I'd read about Carnegie before, but not the details about his libraries. What a wonderful legacy! What a wonderful idea! Thanks for the link giving us the story and philosophy behind his emphasis on libraries in communities. And I had no idea how pivotal a role women's clubs played in securing a Carnegie library in their community. Yeah, I'd heard about him, and libraries, but had no idea how many libraries he helped build. Looking at these links I discovered that a library we loved, in South Pasadena, was one.